Congratulations to you all! May you be blessed! All the best from Haggis and Lucy McNaughty and family in South Africa! AAAAAAAAAAWWWWWWW!!!!!!!!!!! How SWEET!!!! I can't imagine!! Kuddos to Scottie Dad, Mr. K, and Heather for an unbelievable night!! Congratulations! That's quite the event Scottie Dad and your pups put together. I salute their creativity! What a magic moment !!! Love it ! CONGRATULATIONS !!!!!!!!!!!!!! Oh, wow! How wonderful for y'all ! Congratulations and may the four of you have a long, happy and blessed life together. Congratulations and best wishes- what an appropriate proposal!!! He really went to a lot of trouble. Guess Mr K can't be your ring bearer at the wedding. Congratulations! 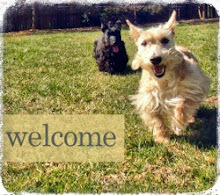 Sweetest story, probably the cutest thing ever of your two Scotties greeting you in their holiday costumes! Mazel Tov!!!! How romantic and wonderful for you all!!! @Judy Oviatt - Not so! We can do some Scottie training. It really would be the best thing ever to have Heather and Mr. K be my flower girl and ring bearer respectively. Can you imagine?! I'm glad the ring was in a box. Otherwise you might have had to wear Mr. K on your hand. Way to go Scottie Dad, you're a keeper. Such a wonderful story- great job Scottie Dad! Congratulations and many happy aRroooooos to you all! Oh my dog! My Peep is SO jealous!!! Congratulations! It is so special that Scottie Dad included Heather and Mr. K! Can't wait to see them included in the wedding too! Congratulations to you two love birds!!! Cheers to many more Happy Holidays!! Congratulations to Scottie Mom & Scottie Dad Mr. K and Heather. You made my heart feel soooooooooo happy for your family. 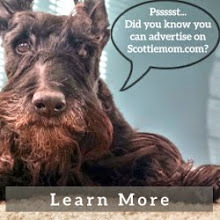 What a very special Scottie Dad. Oh, such a beautiful post! Made me realize there still is goodness between people. Congratulations! Aroooo!!! Terrific Terrific, what a wonderful proposal. Wow. Scotty dad clearly rocks! Congratulations!